The things to do in wedding need months and sometimes even years to plan. It’s common to find incomplete things surfacing at last moment. Avoid these snafus and plan the perfect wedding of your loved one with the help of our wedding planning checklist. Divide the necessary items according to its type and tick off the things that you already have successfully planned with our various template formats. This Sample Checklist Template will allow you to prioritize on the things left to do. Download these free checklist examples for free and make this huge event memorable so that it remains etched in everyone’s memory as the best wedding ever. A wedding planning checklist template is a beautiful template that can be harnessed by organisers of a wedding to pin down the tasks that must be completed by him/her for this wedding. Starting from 12 months before the wedding, the template mentions the ‘to be done’ tasks that should be done by you 12 months before the wedding. Download this template online for free use. Wedding planner printable template is an effectively made document. It can be downloaded for the purpose of planning. This template works like a planner wherein a person- bride/groom can record their plans for the great grand wedding. This template is available online for free use in formats like PDF. 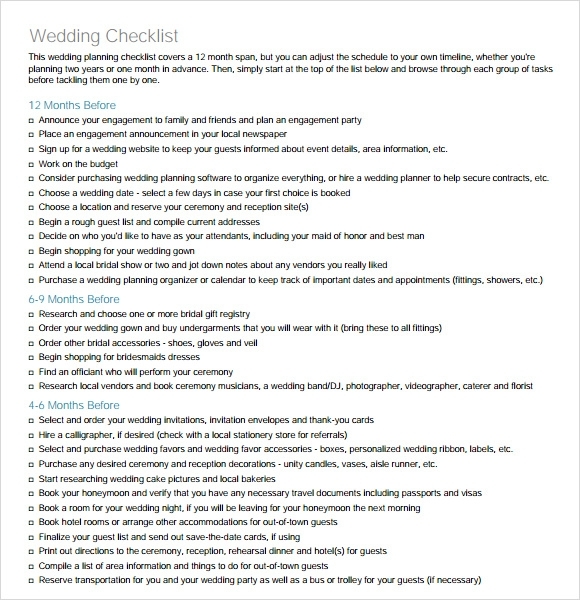 Wedding planning checklist template is a well-designed template. Since it is designed by experts, it is in a format so as to help one plan better for their wedding. Containing all the procedures related to setting of a date, doing the specific research, creating a guest list, setting a budget and so on, this template is quite a buy for you if you plan for creating your very own planner. This free template is available in PDF Format. 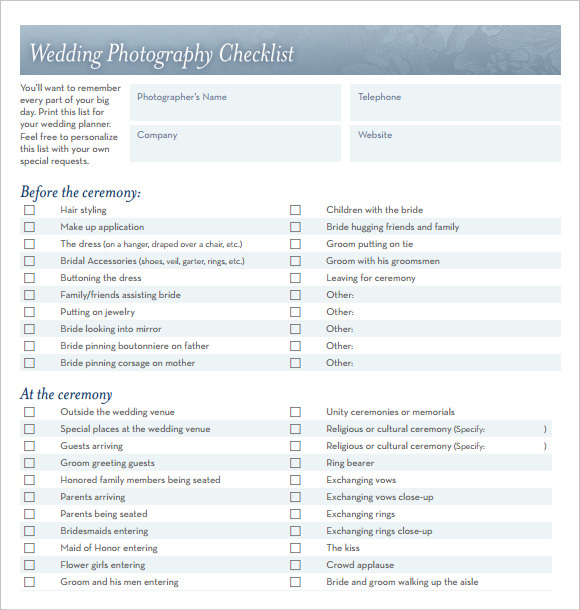 A wedding photography checklist template can be downloaded online for use. 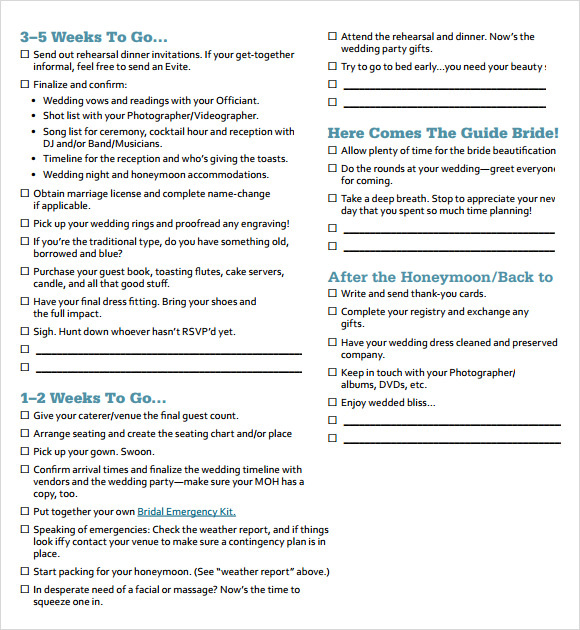 Like other wedding checklist templates, this one is an equally important template that can be availed by users. The only difference is that this one is specifically for Photography during the Wedding event. There must be important list of events that must be part of a wedding photographs, this template contains all the important events whose picture must be clicked like when the bride is getting ready, outside the venue, and so on. This one is also available online for free use in PDF Format. Why do we Need a Sample Wedding Planning Checklist Template? The need of a sample wedding planning checklist template rose when the new generation realised the need of organising a wedding like any other social event. Thus organisers of wedding came into being who gave innovative and interesting ideas for making a wedding better in the same budget. This is because they used all the resources well. Using this concept one can understand the benefits of sample wedding planning templates. 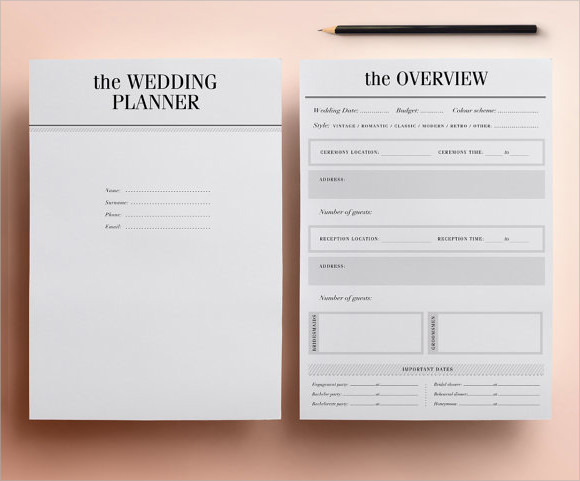 These templates will help one in organising a better wedding by using an organised procedure.You can also see Sample Daily Checklists Templates. When do we Need a Sample Wedding Planning Checklist Template? The sample wedding planning templates insist on managing a proper schedule for oneself which means a person needs to plan his life and the tasks that need to be done for the wedding together. The templates will help you list the things that you need tyo manage with your otherwise hectic schedule so as to create productivity. Weddings are a grand affair that can need even a year. Thus many people start planning 12 months before the D-Day. Many of the templates have such planners as well. One can look at them and refer them for their own use. This can be done by simply downloading these templates from the link given below each template. 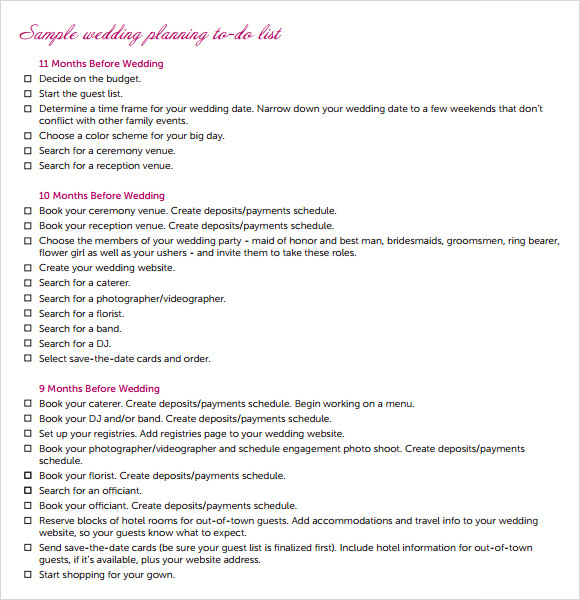 What are Benefits of Sample Wedding Planning Checklist Templates? Firstly the sample wedding planning checklist templates are free of cost, which means the planning can be done using these templates by not entailing an unnecessary expense and by simply downloading them for use. Also these templates are a perfect organisers for a sheen and perfect wedding program. 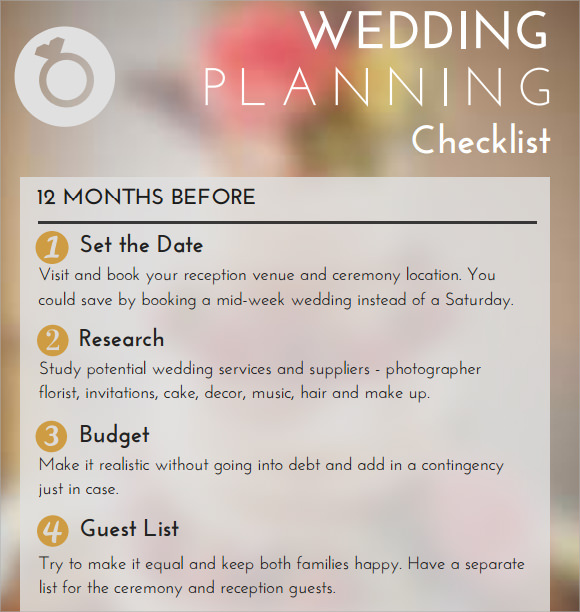 A sample wedding planning checklist template is an interesting way of planning wedding in an organised manner. This combination of wedding planning templates available on this portal will help one in availing a ready-made fix for their wedding process.You can also see Funeral Checklist Templates.